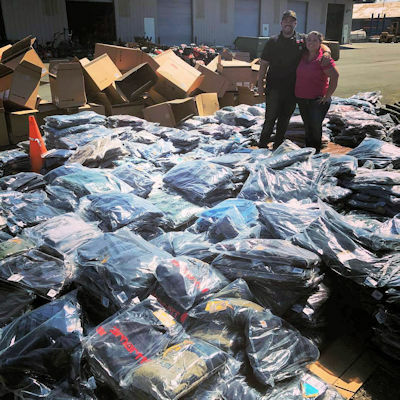 Yep, that’s a lot of Carhartt! You know Fall is really here when the Rainbow stores are packed with Carhartt jackets, vests, sweatshirts and rainwear! Get ready to enjoy the brisk Fall weather, whether you are cutting firewood or hiking with your dog under the changing trees. There’s a huge selection of Carhartt, Wrangler, Ariat, Roper, Corral and Justin apparel and boots in the store now, and more arriving daily. Check out the new styles for everyone in your family, from Papa Bear to the Cubs! Save money too, with the Fall Clothing Coupon – $10.00 off any Clothing purchase of $10.00 or more! Coupon is good through September 27th, and you can print it out right here! ~There’s good news for those who have small critter pets – Rainbow now carries reptile supplies including mealworms, crickets and feeder mice! Watch for an expanded selection of products for snakes, lizards, and iguanas soon in the Ukiah store. ~Also new at Rainbow – we are now carrying Bar Ale products including Non-GMO Chicken Feed, Organic Alfalfa Pellets and Organic Livestock Mix. 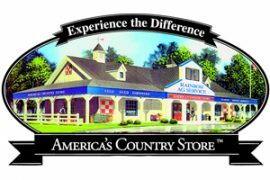 ~One more new item in stock, American Choice Mini-Flake shavings! These super-absorbent, small-sized flakes create less waste due to smaller, uniform sized flakes, and they are dust-free. 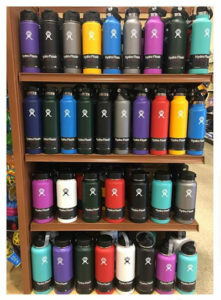 ~Whether you want your beverage to stay cold, or stay hot, you will love the new Hydro Flask. They are more than just a bottle! Two bats have tested positive for rabies in Lake County recently. During the fall, bats gather to migrate to their winter grounds, so there are more bats around now and encounters could increase, as the migrating bats stop to rest in sometimes unusual places. Rabies is a viral zoonotic disease that causes acute encephalitis (inflammation of the brain) in mammals. Since rabies is considered 100% fatal, but also 100% preventable, there is good reason to make sure your animals are up-to-date on the vaccination. The rabies vaccine must be administered by or under supervision of a licensed veterinarian, and are available at the VIP Community Clinics which are held at both Rainbow stores every Saturday. To learn more about the rabies-infected bats in Lake County, check out this article from the Lake County News. Get your calendars out! You won’t want to miss these upcoming events at Rainbow Ag! ~In October, starting on the 17th, it’s the annual Fall Alfalfa Sale! Time to stock up the barn with quality, 3-wire alfalfa hay! ~Join in on one of the most fun events of the year – the Pet Halloween Costume Contest on October 28! Bring your favorite pet in costume to either Rainbow Ag store, for savings, prizes and fun extras! Awards will be given in several categories so get creative and find that perfect costume for your pet. ~Need some power, as in Outdoor Power Equipment? Save big on all outdoor power at the Cost + 10% Sale, November 3 & 4, at both Rainbow stores. September’s Subscriber Coupon – Buy one, get one for half-off, any Greenies Dental Chews. Just print out the coupon (or show us on your phone) and save on the most popular dental chews! For dogs and Cats. Trivia: August’s winner is Goldie Curnutt, with the correct answer that one of the way that Rainbow supports 4H and FFA members is through the Horizon Program. Enter to win a $15.00 Rainbow Gift Card – all correct answers are entered in a random drawing. This month’s question, Which of these animals cannot get rabies? ENTER HERE! This entry was posted on Tuesday, September 19th, 2017 at 3:03 pm	and is filed under News, Rainbow Wags Newsletter. You can follow any responses to this entry through the RSS 2.0 feed. Both comments and pings are currently closed.